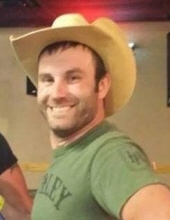 Blake Austin Williams of Fairland, OK passed from this life on Sunday, March 31, 2019 southeast of Miami, OK. He was 31. Blake was born September 25, 1987 in Tulsa, OK to Gordon and Michelle (Martin) Williams. He had lived in the Fairland area most of his life and was a graduate of Fairland High School Class of 2006. He graduated from N.E.O. A.&M. College in Miami, OK and Northwestern Oklahoma State University in Alva, OK.
Blake was a self-employed truck driver and worked as a machinist for G and G Quality Services in Miami and as a mechanic for Ramrod Diesel in Fairland. He loved hunting, fishing, rodeoing and diesel pulls. He was a member of First Baptist Church in Fairland. Blake saved the life of a friend in need. The friend and a truck went off a boat ramp into the Neosho River by Connor’s bridge sinking to around 40’. Blake jumped in and was able to get her out of the truck and back to the surface. Between the drop off, the current and the icy cold water he was barely able to get her to help on the bank. They then tried to get ahold of him to pull him to safety but we’re unable to do so. When they explained they couldn’t get to him he replied with, “It’s ok” and went under. Blake was preceded in death by his grandfathers, Cecil Williams and William Martin. Blake is survived by 2 sons, Tavin Williams of Eufaula, OK and Tripp Williams-Corn of Cassville, MO, his parents, Gordon and Michelle Williams of Fairland, OK, 1 brother, Gordon Williams, Jr. and wife Teia of Fairland, OK, 2 sisters, Elisha Jones of Jennings, OK and Stephanie Collins and husband Tucker of Sapulpa, OK , his grandmothers, Gail Williams of Grove, OK and Betty Martin of Muskogee, OK, and his nephews and nieces who he was Uncle Bunkie to, Maddison McGhee, Talin Jones, Raylen Williams, Makenna Williams and a niece on the way and his great nephew Jace Buffalomeat. Services will be 2:00 p.m. Thursday, April 4, 2019 at Fairland High School Gymnasium with Rev. Andy Krebs officiating. Interment will follow in Fairland Cemetery. Rodney Knepp, Jake Stunkard, Justin Hill, Kyle Elam, Codi Oleman and Troy Mathia will serve as pallbearers. Tavin Williams and Tripp Williams - Corn will serve as Honorary Pallbearer. The family will receive friends from 6-8 p.m. Wednesday at Paul Thomas Funeral Home Chapel in Miami, OK. Services have been placed in the care of Paul Thomas Funeral Home and Cremation Service of Miami, OK.
To send flowers or a remembrance gift to the family of Blake Austin Williams, please visit our Tribute Store. "Email Address" would like to share the life celebration of Blake Austin Williams. Click on the "link" to go to share a favorite memory or leave a condolence message for the family.